At the end of 2015 I thought a lot about my blog, what I’d achieved so far and where I wanted it to go next. (You can read more about this in my post: Happy New Year and my Easy Peasy Foodie 2015 Roundup) One of the challenges I set myself for 2016 was to start writing reviews. I’m keen to write reviews on cookery books, food related products, services and equipment and maybe even the odd restaurant – we shall see. To start with, though, I thought I would tackle my enormous collection of recipe books. I just love recipe books and have amassed loads over the years (I have just counted them and it turns out I have 42!). I’m one of those daft souls who just loves reading recipes for their own sake and eagerly devours all the accompanying blurb (don’t get me started on cookery books that only have recipes in them and no words/explanations/stories), but I also love them for discovering new recipes too. I sometimes cook the actual recipes in my books, but often I just use them as inspiration for creating my own recipes. Now is the time of year when traditionally we are all trying to be a bit healthier (or have failed miserably in January, so are planning to try again in February). 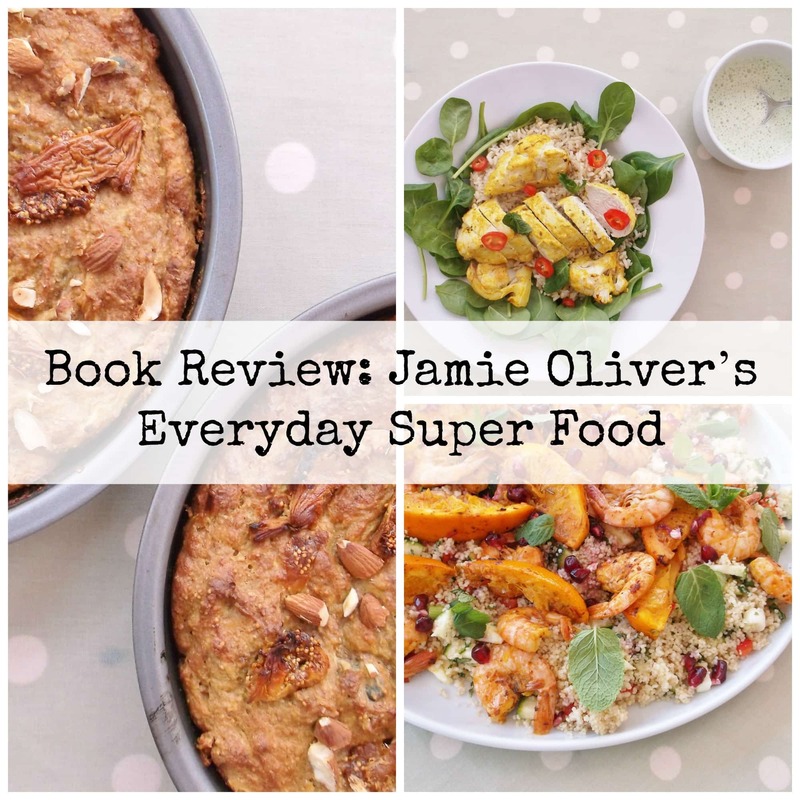 So to kick things off I thought I would review Jamie Oliver’s Everyday Super Food: a book which sets out to encourage us all to eat healthier, more nutritious food. I am a big fan of Jamie and have most of his other cookbooks too, but this is my most recent acquisition. I like Jamie because his recipes are generally straightforward to follow, they mostly work (I always find it amazing how often recipes in big glossy published recipe books don’t work!) and he has some great ideas…interesting enough to inspire but not so off the wall to just be plain weird. He also generally assumes you have a normal kitchen with normal equipment. Always helpful. 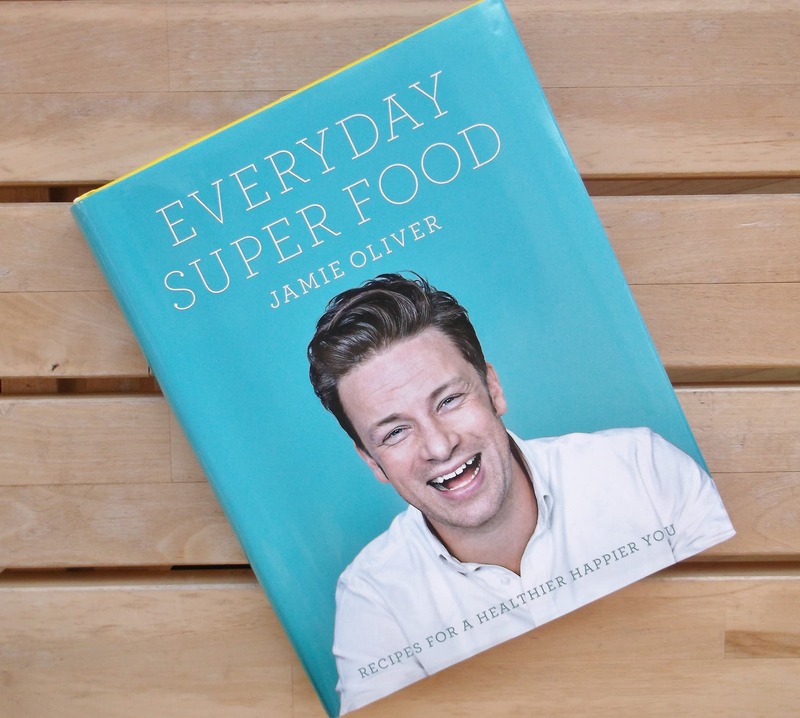 Everyday Super Food is Jamie’s latest book and accompanies his recent Channel 4 series Jamie’s Super Food. (You can still watch Jamie’s Super Food on 4OD.) 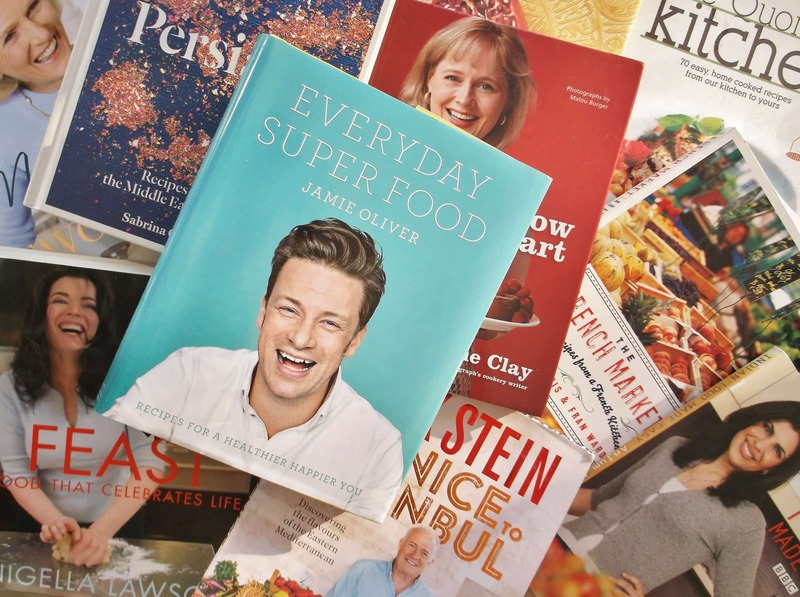 The idea behind the book and TV series is, in Jamie’s words: “delicious, nutritious, achievable meals that help you cook your way to a healthier, happier, more productive life” – which in my opinion is a GREAT philosophy for a cookbook. To write the book, Jamie spent time learning from health and nutrition experts about what healthy balanced food really looks like, getting behind all the fads and made up science that is out there. He also visited some of the healthiest places in the world, such as Ikaria in Greece, Okinawa in Japan and Costa Rica, to see for himself why the people who live there are so healthy and why they live so long. (You can see his trips and the people he met in his TV series.) Jamie even studied for a nutrition diploma, he was so keen to get to the heart of understanding what good nutrition is all about. The book is divided into three main sections: Breakfast, Lunch and Dinner and there are 30 recipes in each section. There is also a section on drinks and snacks and a “live well” section at the end where Jamie goes deeper into the philosophy of the book and gives lots of hints and tips on how to eat and live more healthily. 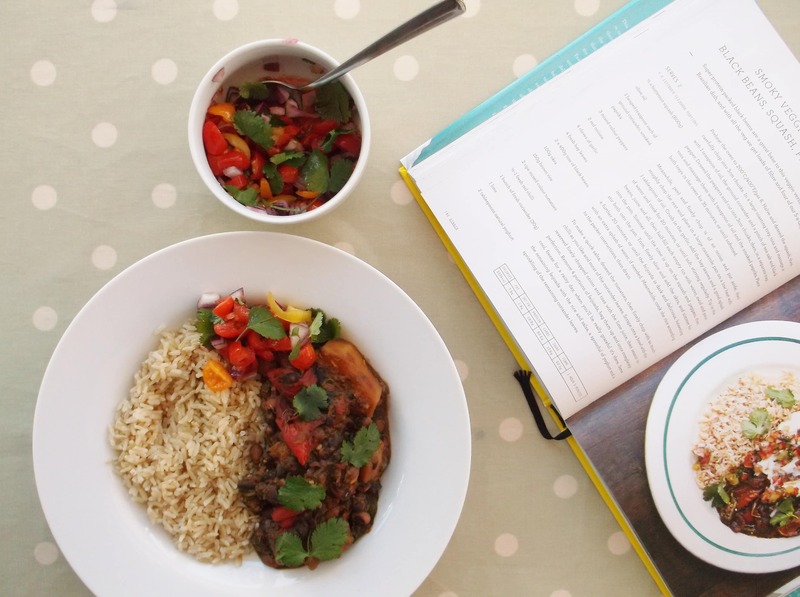 One of the things I really love about this recipe book is that each recipe is clearly laid out with a beautiful photograph next to it, so you know what you are aiming for and a little blurb at the top which tells you what is nutritionally good about the recipe. As you would expect, each recipe contains detailed nutritional information, telling you about carbs/protein/fat/sugar etc. If I had one little niggle with the recipe layout, it would be that the method is given as one big chunk of text, not broken down into numbered steps. I much prefer numbered steps as it is easier to find your place as you are working through a recipe. In general the recipes are easy to follow and there are a lot of recipes that take under half an hour, with the majority coming in at under an hour. As you’d expect with Jamie, the instructions are clear and easy to read and he doesn’t expect you to have lots of fancy equipment. That said, he does assume you have a blender and a food processor, but I think so long as you have a hand held blender you’d be fine with these recipes. Failing that a potato masher and or an ability to cut small would probably work. I am not a big fan of recipes for breakfast. I lead a busy life and generally have less than 30 minutes a day to prepare, eat and wash up after breakfast – even on weekends! I am strictly a toast and cereal girl. However, if you have more time than me, there are some great recipes to choose from to make breakfast time much more interesting and nutritionally beneficial. Some highlights include: Figgy Banana Bread, Vegeree (vegetarian kedgeree) and Jamie’s delicious take on Bircher Muesli. To be honest a few of the ideas in this section are a bit wacky and won’t suit everyone, but there are plenty of good solid breakfast ideas for those who have a bit of time in the mornings, and for those, like me, who don’t, a lot of his breakfast ideas would make great lunches. 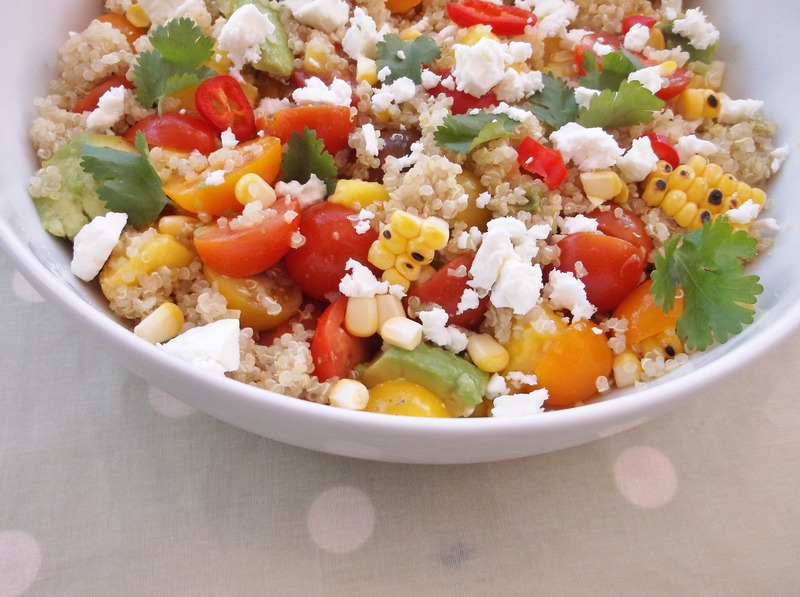 For example – I find the idea of Chicken, Quinoa and Loadsa Veg Salad a bit bizarre for breakfast, but an absolutely fab idea for a (packed) lunch. Although Jamie divides the next two sections into lunch and dinner, they really are interchangeable. 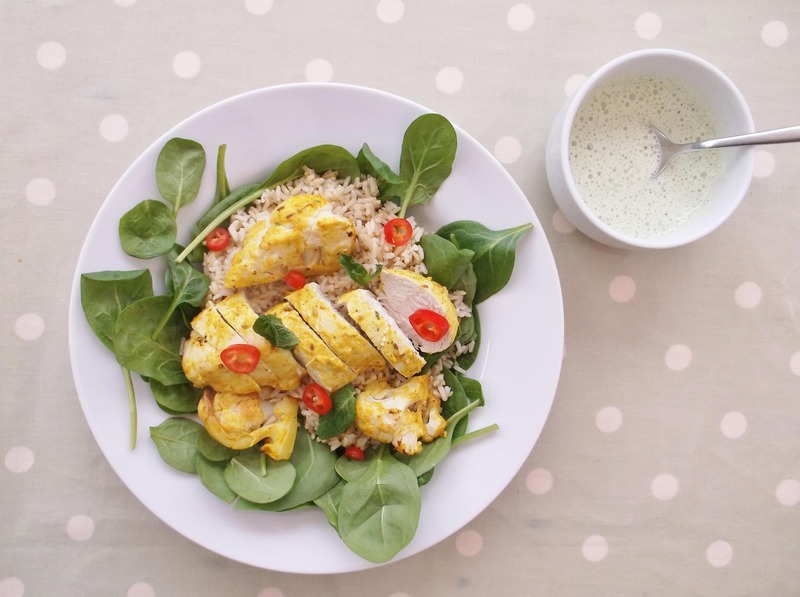 The lunch recipes do look delicious and most of them are pretty quick (most take under 30 minutes), but I would say the majority are weekend lunches not midweek ones, at least not if you work outside your home and need to take in a packed lunch. He does have a couple of nice take-to-work ideas though, including some gorgeous looking jam jar salads, Grilled Corn, Mango and Avocado Salad with Quinoa and a lovely looking Seared Tuna and Sicilian Couscous Salad, as well as some delicious sounding soups, but these all assume you have quite a bit of time to prepare lunch the night before. That said, most of these recipes would make lovely quick weekend lunches and the majority would work very well as quick midweek suppers too. The dinner recipes generally take a bit longer but are not complicated to make. The longest recipe takes 2h20, but the majority take no more than an hour and some are even quicker. There are some fab ideas here and it is definitely my favourite section of the book. 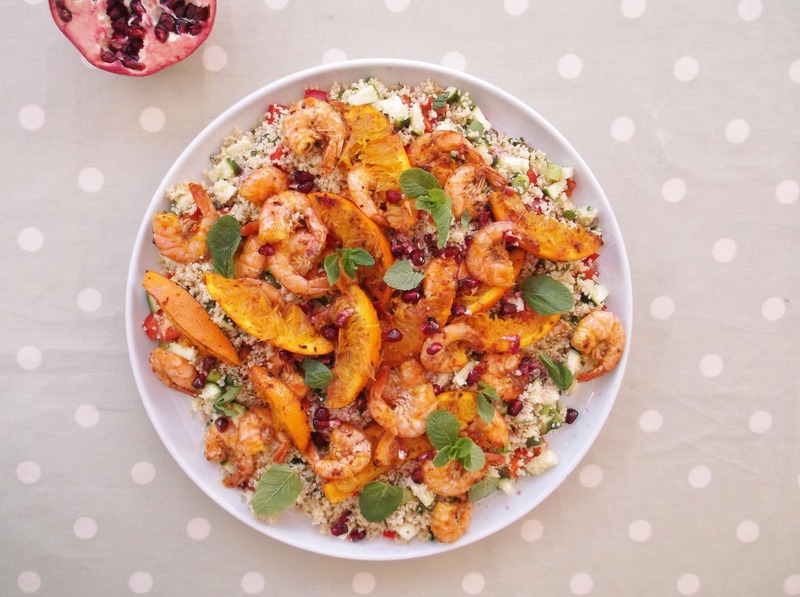 My favourites are Chicken and Squash Cacciatore, Harissa Roasted Aubergine, Smokey Veggie Feijoada and Sizzling Moroccan Prawns. Such interesting and exciting flavour combinations from all over the world. It was hard to decide which one to try first. The last section of recipes is a great little chapter on snacks and drinks, including recipes for 100 Calorie Salads, Skinny Houmous, Marmite Popcorn (yes really) and Raw Vegan Flapjacks. I also particularly liked his section on flavoured waters and teas. I am terrible when it comes to drinking…until recently I lived on a very bad mix of coffee, hot chocolate and wine. But recently I’ve really been making an effort to drink more healthily. Cutting out hot chocolate altogether and cutting back on coffee and wine and instead drinking more water and herbal teas. But I do still find water quite boring, so I love Jamie’s ideas for flavoured waters and teas. I particularly like the idea of Pomegranate, Ginger and Lime Flavoured Water as well as his recipe for Ginger, Turmeric and Lemon tea. Jamie’s final section goes more in depth about the philosophy behind the book. Jamie explains the principle of a balanced plate, encourages us all to eat breakfast, drink more water, eat more fruit and veg and sleep more (chance would be a fine thing, Jamie). I really like his common sense, no nonsense approach: he doesn’t advocate cutting out major food groups, but rather suggests eating healthier versions of carbs/fat/dairy etc. For example he suggests getting carbs from fruit, veg and wholemeal alternatives to pasta, rice and bread, rather than eating cake and white bread – all obvious stuff, really, but sometimes it’s helpful to be reminded. The only thing that I really feel is missing from this very comprehensive book of healthiness is some dessert recipes. There are one or two things…some nice fruity frozen yogurt recipes at the end, a delicious banana bread recipe in the breakfast section and a recipe for fruit salad in there too, but I wish there was a section in its own right with 30 healthy pudding/cake recipes…but maybe that’s just wishful thinking? I think most people would be surprised about the portion sizes – they are quite small and in particular the portion of meat he advises is often tiny. I was very happy with this – after all Jamie and his nutrition team have worked it all out very carefully and if the portion seems small, then I guess I need to learn to eat smaller portions, but I imagine some people would get rather frustrated by the small quantities. I guess it’s up to you – if you feel you want to eat more, you can always increase the quantities, but it is quite an eye-opener as to how small a portion 600 calories actually is. If you want encouragement to get your portion sizes down then this book is really quite helpful. Jamie’s reliance on blenders and food processors also slightly annoyed me. It is not a piece of kitchen gadgetry that everyone has and given the market he is aiming the book at and the fact that he wants to encourage people to cook rather than go for unhealthy takeaways and ready meals, I felt he should have at least made some suggestions about how to work round the problem. I used my hand held blender and or chopped things finely and it worked out OK. But I feel it would have been helpful if Jamie had given alternatives himself. So far I have tried 10 of the recipes from this book and so far I can report that they are all delicious, relatively easy to make and the majority are pretty quick too. My favourite by far has been his Grilled Corn and Quinoa Salad, which was fresh, vibrant, delicious, beautiful and only took 20 minutes to make. My least favourite was his Happiness Pasta – the flavour combinations just didn’t work for me and it was visually unappealing, which is rare for Jamie’s recipes. My husband and I are trying to have a healthy January and that means no cake. 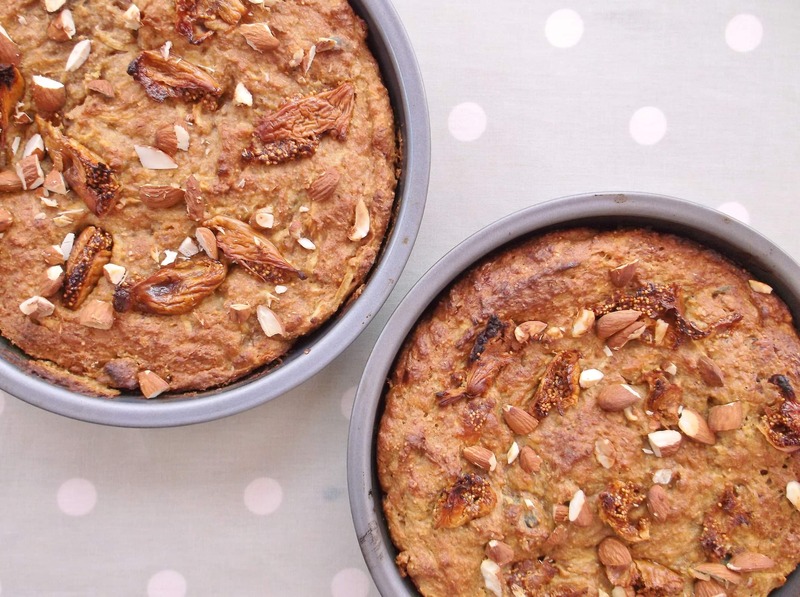 So Jamie’s figgy banana bread is the perfect alternative to cake: it contains no refined sugar (the sweetness comes from figs, bananas and apple), no butter (the fat comes from yogurt and olive oil) and lots of goodness from fruit, nuts, seeds and wholemeal flour. It was quick and easy to make and turned out just like the picture. Jamie used a blender but I found it perfectly possible to use a hand held blender and a good old fashioned wooden spoon! I just loved the name of this dish. It’s a vegetarian version of a Brazilian classic (no, I hadn’t heard of it either!) It’s a little more time-consuming than I would usually make, but still relatively simple. It took about an hour to make and most of that was hands on time, so it’s more the sort of thing I would do at the weekend rather than on a weeknight. It is absolutely full of goodness and a whopping great 4 of your 5 a day! The star of the show was the little salsa that accompanies this dish, which took less than 5 minutes to put together. I will DEFINITELY be making that gorgeous little salsa again! 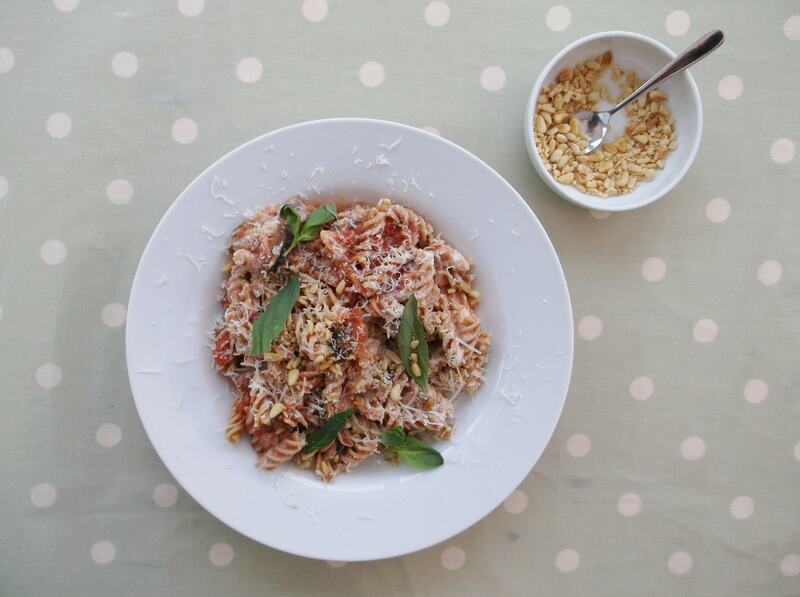 I made this for a weekend lunch and but it would work brilliantly for a midweek supper too. Jamie marinates prawns in a mixture of rosemary, garlic and orange, before frying them up and serving them on a bed of wholewheat couscous, mixed vegetables (I used red peppers, courgette and spring onions) and herbs. I had never heard of wholewheat couscous before…it tastes very similar to its non-wholewheat cousin but is much better for you. I will definitely be buying the wholewheat version in future! My only complaint about this dish was the two parts seemed to belong to two different dishes. I loved the prawns (I would have never have thought of putting that marinade with them but it really worked!) 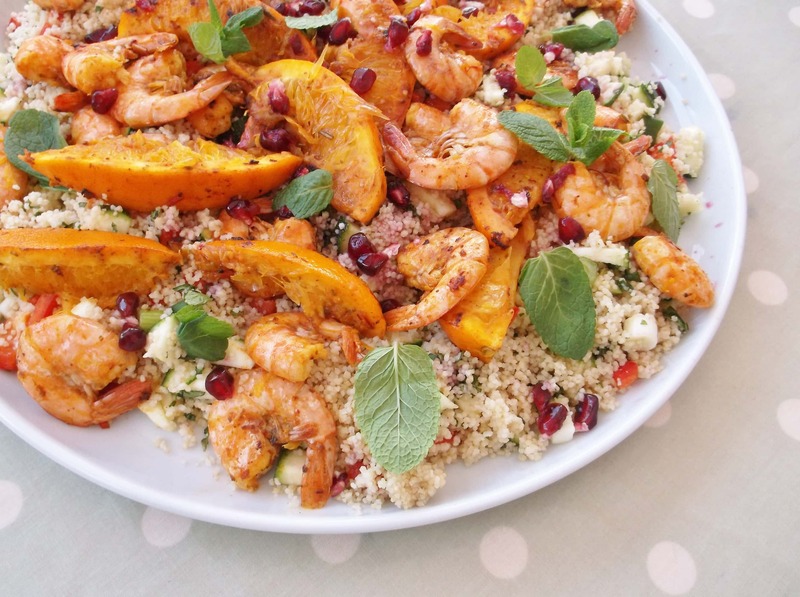 and I loved the couscous mixture but, for me…and my husband agreed, they didn’t quite work together. This was the one dish I tried that I just didn’t like (and neither did my husband, or my kids). I normally fry or roast aubergines, but in this recipe Jamie steams them and they just seem to lose all their flavour cooked this way. He also stirs in ricotta and the end and, for me, this just doesn’t go with the tomato and aubergine sauce… I would have preferred mascarpone or mozzarella or just no cheese. I would like to have a go again at this recipe as I think with a couple of tweaks it could be really nice. I did like Jamie’s idea of sprinkling toasted pine nuts on as a garnish…loved the flavour and obviously this also adds a little extra nutrition. I am a little late to the quinoa party…I kept meaning to try it, but had never quite get around to it. Everyday Super Foods features several quinoa recipes so it seemed like the ideal opportunity to try out this supposed wonderfood and I was not disappointed. 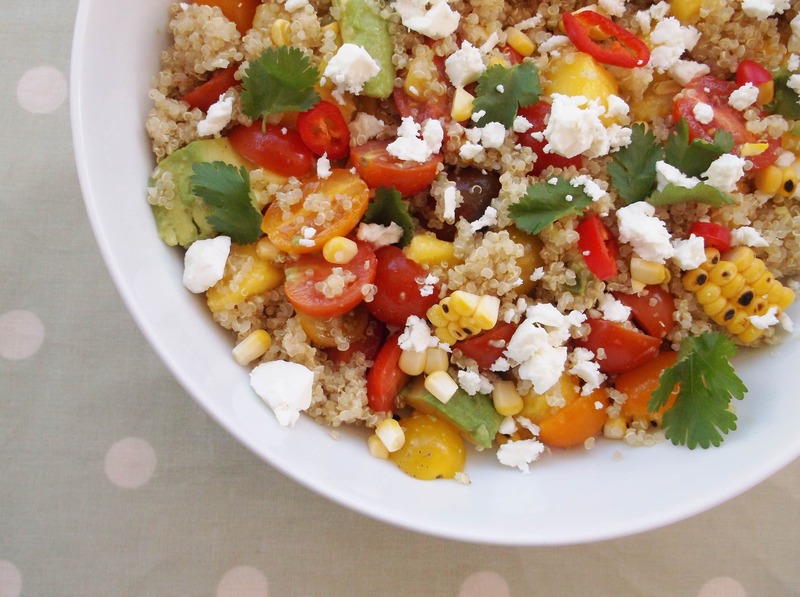 Jamie pairs the quinoa with a delicious combination of avocado, mango, sweetcorn, tomatoes, feta and chilli and, as is so often the case, his flavour combinations are spot on. I absolutely loved this salad and would have happily wolfed down seconds, if it wasn’t for the fact that I knew my firsts already contained 438 calories. My husband had this the next day at work and he was equally impressed – it’s a great take to work meal if you have a bit of time the night before. If you want a book that is brim full of healthy, relatively easy to make (if sometimes a little unusual/adventurous) recipes, then this is the recipe book for you. I love the idea of someone else doing the sums and working out what is good for me, I love the way Jamie writes and I love the slightly unusual ideas he comes up with. However, if you are the sort of person who likes plain, ordinary food made from ordinary ingredients (I don’t mean that pejorative way – I know that’s what some people like and that’s fine) you might find some of his ideas a bit wacky. If you are looking for a book that contains lots of dessert recipes or work lunches you might find this book is not for you either. But if you are wanting to eat better in 2016, then this would be a great book to get. This is not a diet cookbook per se, it’s a book that challenges you to eat more healthily, and be a bit more adventurous but presents it all in an easy and accessible way. Have you read this book? Do you agree with my review? Are there any other recipe books you would like me to review? I am always open to suggestions! Thanks for the great, in depth review. I bought this book before Christmas and agree that some of the recipes take too long for a week night meal, but I’m enjoying trying them out. I can highly recommend the Indian Roasted Cauliflower, Pineapple, Chilli and Coronation Dressing (even better cold the next day if you have leftovers). We’ve also loved the Tasty Samosas and the fact that even with only 100g of mince, my husband didn’t feel he was missing out on meat! I agree with you that a few more recipes in the desserts section would have been welcomed. Will try the figgy banana bread next…. Hi Eb. 🙂 I really enjoyed reading your review. I’d definitely love to read more similar reviews, so I’m glad it’s your plan to do so! I also got this book as a birthday present! 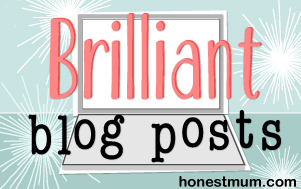 I chuckled at your thoughts on the breakfast chicken recipe because I thought the same thing! Definitely more of a lunch meal! I also prefer a step-by-step method. I’m not one of those types that can read through a recipe twice and then just get on with it – I always like to refer back. Hehe. I too have quite a collection of recipe books ..in fact I think Mr E & I need put up another shelf or two for them! I do actually have a few of Jamie’s books and enjoy watching his more recent cooking programmes (30 minute meals etc) but haven’t bought this book yet, it’s lovely to read such a detailed review. I totally agree that it’s frustrating when recipes call for gadgets that even us keen cooks / bakers don’t have like food processors etc and you rightly say that not providing alternative suggestions to achieve the same / similar result is missing a trick when he’s aiming to get the country cooking from scratch a bit more. Regarding the black beans…I too was searching for some a couple of years ago when I saw a recipe for black bean brownies which I just had to try. It was by an American blogger but I figured they must be available somewhere here in the UK. Having tried a couple of supermarkets, I actually found them in Sainsburys in a tetra carton (rather than a can). This is one very accurate review on Jamie Oliver’s book. I’ve tried few recipes and they were easy-to-make recipes with normal available equipments at home, for breakfast, lunch, snacks or dinner.